With a stay at Locanda Ca' Foscari in Venice (Dorsoduro), you'll be within a 5-minute walk of St. Mary of the Friars and Ca' Rezzonico. The front desk is staffed during limited hours. With a stay at B&B Le Ninfee in Positano, you'll be minutes from Positano Town Hall and Church of Santa Maria Assunta. With a stay at Campomaggio in Marliana, you'll be within a 15-minute drive of Pistoia Zoo and Chiesa di San Francesco. Free self parking is available onsite. Located in San Giuliano Terme, Villa Alta is within a 15-minute drive of Leaning Tower and Knight's Square. Free self parking is available onsite. With a stay at La Locanda del Podestà in Ricco del Golfo di Spezia, you'll be within a 15-minute drive of Gulf of La Spezia and National Museum of Transport. With a stay at Residence Li Russi in Castelsardo, you'll be within a 10-minute drive of Doria Castle and Museum of Mediterranean Weaving. 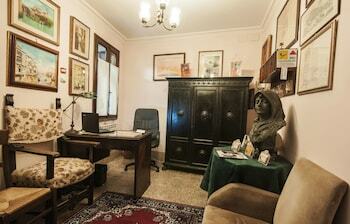 When you stay at Historic Boutique Hotel Maccarunera in Campagna, you'll be 8 minutes by foot from Campagna Museum. The front desk is staffed during limited hours. Located in Rome (Vatican), Hotel Giuggioli is within a 15-minute walk of Spanish Steps and Vatican Museums. Featured amenities include a 24-hour front desk and luggage storage.